"One of the best aspects of working at DELTA |v| is the opportunity to work with various design programs to create awesome animations." Nikit Shetti, Forensic Animator, joined the DELTA |v| digital media team in 2016. Nikit works in the realms of 3D modeling, 3D scanning and graphic image texturing. He is also skilled in photogrammetry, or the technique of taking measurements from photos of an incident to determine the pathway a vehicle traveled. His talents help clients and their audiences visualize complex scenarios so that all parties involved in a case understand what happened. 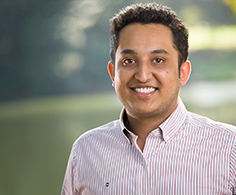 Nikit earned his diploma in Information Technology from Thakur Polytechnic in Mumbai, India. His animation class at Thakur inspired him to pursue a Bachelor’s of Fine Arts in Animation, which he received from Savannah College of Art and Design in 2015. While at SCAD he worked on various animated film projects. One film, “Leave with Me,” was featured at the 2016 ASIFA-South RYO Animation Festival, 2016 Seoul International Youth Film Festival, 2016 Kuandu International Animation Festival and the 2016 IndieWise Virtual Festival. Nikit is driven to learn any new animation technique or program he can. His drive to learn carries over into his personal life, where he discovers new things by watching documentaries, cooking, playing billiards or going on long drives.